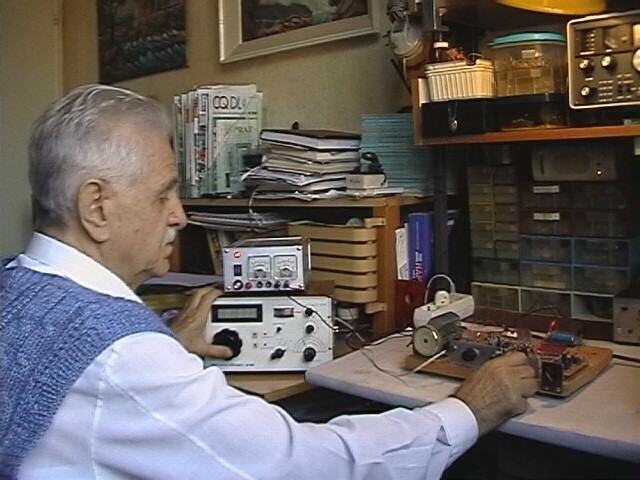 The Tayloe receiver is a new type of digital SSB and single-sided CW RX, invented and patented by Dan Tayloe, N7VE. It works on a new principle derived from digital filters. In its heart there is a fast 1:4 demultiplexer. The best IC for the purpose for now is a 3253 chip, with any letters in front of that number - depending on the producer. You can get and download detailed information about the Tayloe detector from the American Patent Site (patent number 6230000). Here is a popular illustration of the basic principle how the Tayloe detector works: we all remember the situation from western cowboy films when a coach runs away from Indians, but the wheels seem to be standing still. This illusion is visible when the number of frames in the camera becomes the same as the number of wheel spokes changing in front of our eyes - i.e. 25 per second. Electronically speaking this is zero-beat and the wheel seems to be standing still. Now, if the number of spokes per second is slightly higher than 25 per second, the wheel will seem to be turning slowly forwards (this is USB), and if it is somewhat slower, the wheel will be turning backwards (this is LSB). To my knowledge there are no symmetrical or mirror frequencies in the Tayloe detector. Therefore this is not a mixer, but a detector, as Tayloe has named it. The only difficulty with this detector is that the VFO (or BFO) must have four times higher frequency than the input one is, which puts high demands on the local oscillator. (E.g. when you listen to 14 MHz, the VFO must work on 56 MHz). I got my first information about the Tayloe detector on the hams' news group in summer 2001, and from the downloaded patent documentation (see Fig 1). I have bought the necessary chips from the Digi-key Corp. by e-mail. The specimen described here is strictly experimental - I wanted to know how it works and get some experience, so everything was mounted on a piece of wooden board. It was made in a hurry and improvised, so I am aware that it is very ugly and does not look like a receiver at all; however, it works. Only the first five chips have got a double layer PCB (IC1 - IC5), and all the rest was soldered on four pieces of perfoboard. Fig. 1 shows the basic electric diagram of theTayloe detector as taken from the Patent documentation. Fig. 2 represents the experimental receiver. IC1 (74LS00) is a pulse shaper which turns sinusoidal signals from the VFO into square pulses because IC2 needs them. IC2 is a binary counter (74ACT163) needed to control and 'turn the switching arm' of the IC3 (FST3253) which is the heart of the detector. Each pulse moves the arm one step further. Now it is clear why the VFO must be 4 times higher - because each step makes 90 degrees and four steps make one full cycle - 360 degrees. C1 - C4 are 0.27 - 0.47 microfarad polystyrene capacitors. I used four 0.33 uF, but they all must be within 2% of tolerance among each other, or the opposite sideband will not be reduced well enough. Together with R1 (47 ohms) they make four RC-constants; which are loaded with 90 degrees of phase-shift between them in one cycle. After that the signal pairs (pins 6 and 4, or 5 and 3) with 180 degrees phase-shift are routed to IC4 and IC5 (TL071 both), so at their outputs (pins 6) we get one 0 degrees Inphase baseband channel (I- channel) and one 90 degrees Quadrature channel (Q -channel). The balance between them is adjusted with P2 - a 10 kOhm trimmer potentiometer - until the opposite sideband is reduced as much as possible. 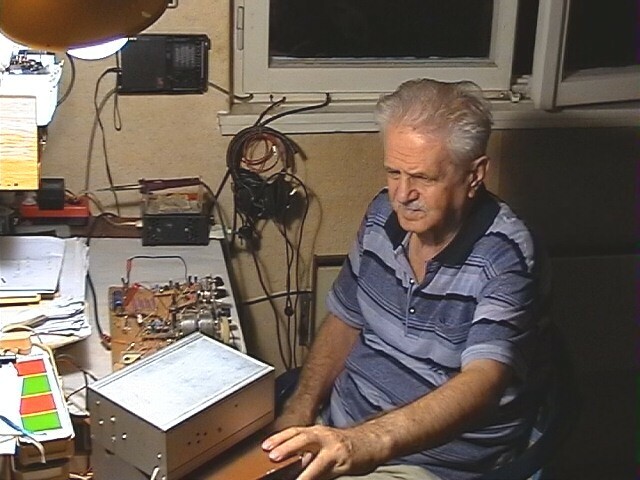 As a VFO I use a home-made DDS 0 - 60 MHz, 100 Hz step, with quartz stability and with about 2 volts of v.f. output. The signal has to be very clean or otherwise you will hear many 'birdies'. Now go to fig. 3 where you will first see the Polyphase network (PPN) drawn as a block, whose duty is to supply correct phase relations between the two channels, so as to produce an SSB signal in the differential amplifier IC6, i.e. they must be 180 out of phase for all the audio frequencies between 300 Hz and 3000 Hz. The electric diagram of that polyphase network is shown in fig. 4. It has been mounted and soldered on a 45 mm x 60 mm perfoboard. All the resistors are 10 kOhm - 1% tolerance, and the polystyrene capacitors must be carefully chosen among many. It is not essential that the capacitors be exactly 47, 33, 22, 15, 10 and 6.8 nF each, but within the same group they have to be as close to each other as possible - in order to get a 2% tolerance among them. I bought 10 pieces 10% capacitors of each value and measured them with a precise capacity meter (YU FUNG YF-150). Then I took the four closest values from each group. The input and output pins of the PPN are marked with numbers which are used as orientation in fig. 3. IC6 in fig. 3 (TL071) is a differential amplifier (older people would call it a push-pull input amplifier). The two signals add up and at pin 6 we finally get an SSB or a one-sided CW signal. (Use a signal-genarator at the antenna input, go back to P2 and adjust it to reduce the opposite sideband on CW until it is not heard). Since IC2 binary counter (74ACT163) does not have an up/down pin, the USB/LSB switching must be done at the polyphase network by switching the input wires between pins 2 and 3 of the PPN - with a DPDT switch S-1. (I improvised it with a quartz crystal socket and two short pieces of thick wire as connectors, instead). We must not forget the input circuits. Although theoretically there is no need for one, there is a simple resonant circuit with a variable air capacitor C5 - 500 pF of maximum capacity. 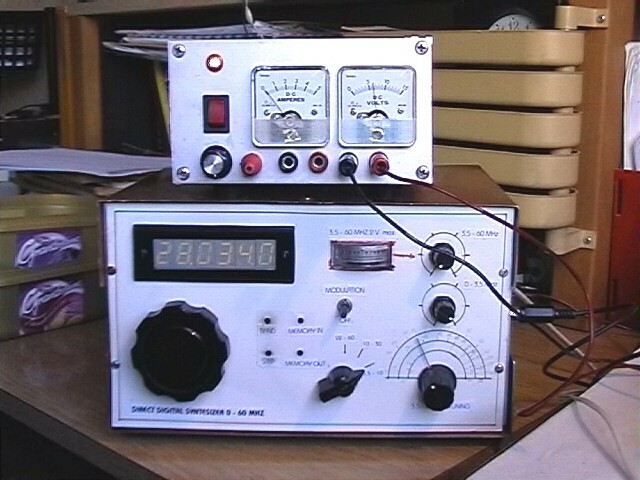 It can be tuned to four bands - from 3,5 to 14 MHz. The coil is a small no-name toroid with 20 turns of insulated wire in the primary (or as many turns as necessary), and 2 turns in the secondary. The antenna tap is at the 4th turn of the primary. P1 serves to adjust the bias for IC3, IC4 and IC5. Adjust it to the best results. What follows is taking care for sensitivity and selectivity, which are achieved in the audio part of the receiver. 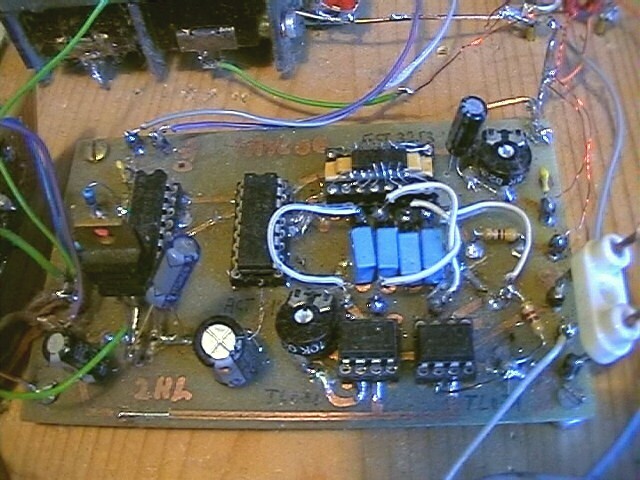 IC7 (TL071) is an audio preamplifier. 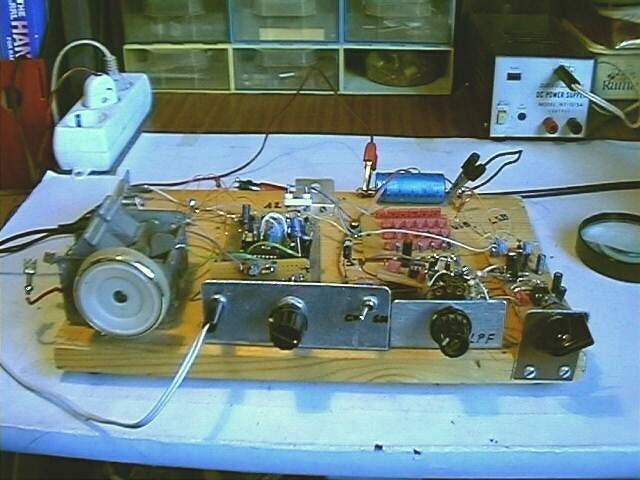 Its amplification factor can be controlled with P3 - a 100 kOhm potentiometer mounted on the front panel. In fig. 5 we can see two filters: a tunable SSB filter (IC8 - TL071) and a tunable bandpass CW filter (IC9 - TL071). S-2 is used to choose between them. They have proved to be very useful. 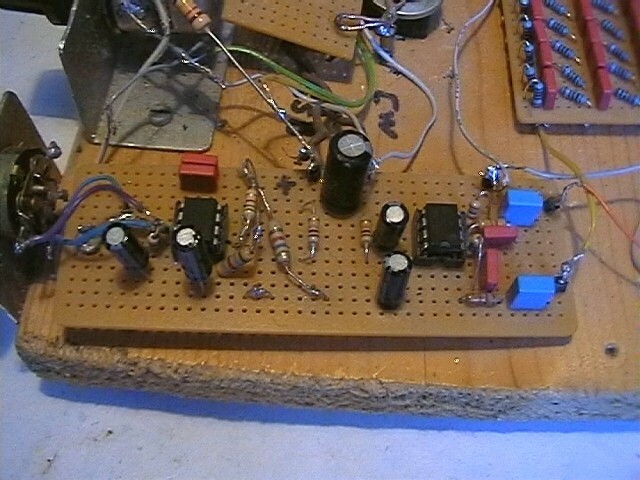 I did not bother to build a final audio amplifier, but I use a cheap outside amplifier with two loudspeakers for the PC. Its sensitivity is about 20 mV for good room loudness, and it is cheaper than a pair of sensitive earphones. The main part of the receiver is the Tayloe detector which corresponds to fig. 2. It has a double layer PCB - 100 mm x 60 mm (fig. 6). Please notice that the copper foil is on the upper side - for convenience. All the components have also been soldered on the upper side. The whole opposite side is the ground, so it must not be etched. Protect it completely before etching! In fig. 7 you can see the disposition of the components. First drill 1 mm holes for all the components. Then, on the opposite side, using a 3 mm bit drill, carefully remove the copper around those holes that must remain insulated, and the ones that will be grounded leave untouched. This is an opposite logic than usual, but it is a simple way to produce double layer PCBs, which seem to improve the work of the Taylo detector. In fig. 6 all the points that must be grounded are marked with a ground symbol. Also all the dots on the template mean 1 mm holes for the ground. When you solder component pins that must be grounded, do that on both sides. Professional DIL sockets are used - those with rounded holes and pins coming from short cylinders, because they are safer and more easily soldered from above. 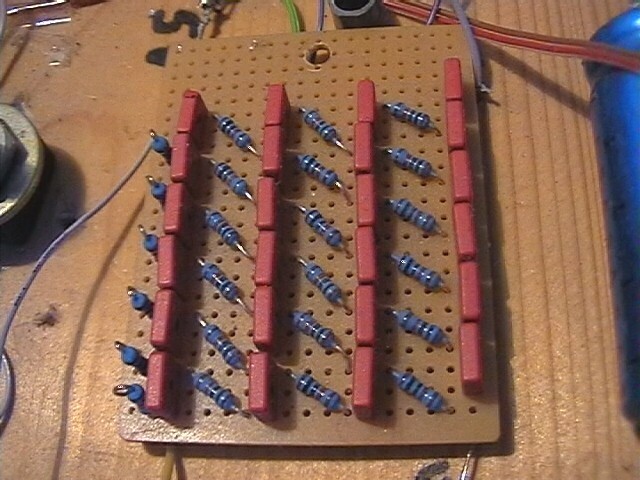 The 3253 demultiplexer is an SMD type which makes work difficult. So I first resocketed it onto a professional DIL-16 socket.. Do it this way: Shape a piece of wood 20 x 4 x 5 mm and fix it with some glue along the middle of a professional DIL-16 socket. Fasten the socket so that it cannot move. Then place the 3253 chip normally over the wood and glue it there - so that it is positioned above the two rows of 8 holes. Then take about 0.5 m of naked clean copper wire 0.2 mm in diameter (BWG 33) and solder one end into the first hole. Then touch pin no.1 of the chip with the same wire and solder it there in the pin's left corner with a very fine solder tip. Use a 25 W soldering iron or smaller. Do it quickly, then cut the rest of the wire. Continue all around the socket until all the 16 pins are connected. Check for short circuits or bad connections and you have got a DIL-16 3253 demultiplekser. The PCB in fig. 6 has been forseen for such a resocketed 3253 chip. When the PCB is ready, first solder the five sockets by putting some melted solder to the outer side of the pin cylinders. Check for "cold" connections with an ohmmeter. The capacitors should be raised 3 mm above the foil when being soldered. There are two jumpers - for C2 and C3. Make sure that the opposite layer is well connected with the upper grounded points. The rest of the receiver is shown in figures 3 and 5. Those stages are soldered on convenient pieces of perfoboard. I suppose that the Tayloe receiver will not be built by a complete beginner, so there is not much more to say about this receiver. The power supply must be stabilized and well filtered. IC1 to IC3 needs 5 volts as TTL chips, other chips are fed with 9 or 12 volts. The receiver looses little sensitivity if you use 5 V for all the stages. As I said, this is an experimental example, so when you build it you have got a good sample for further experiments. I firmly believe that the Tayloe receiver has future, especially in ham equipment.